J Clin Invest. 2006;116(1):2–2. https://doi.org/10.1172/JCI27539. Vivien Spitz. Sentient Publications. Boulder, Colorado, USA. 2005. 192192 pp. $23.95 ISBN: 1-591-81032-9 (hardcover). This shocking first-hand account of the monstrous behaviors of Nazi physicians by Vivien Spitz should be required reading for all medical, dental, nursing, and public health students and faculty. Time is better spent reading this book than filling out HIPAA forms and other well-intentioned but even less effective tools designed to protect patients’ interests. Spitz was a 22-year-old court reporter during the doctors’ trials at Nuremberg following World War II. 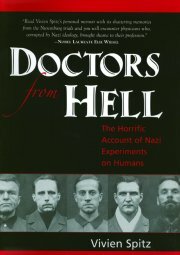 In Doctors from hell: the horrific account of Nazi experiments on humans, she recounts in vivid, objective detail the horrific human experiments conducted by 20 so-called physicians and medical assistants in Germany under the direction of the Nazis. The human experiments included “high-altitude” experiments in which concentration camp inmates were forced, without oxygen, into high-altitude chambers that duplicated conditions at up to 68,000 feet; removal of sections of bone, muscle, and nerves, including whole legs removed at the hips to transplant to other victims; artificial wounding and exposure to mustard gas; wounding of two limbs and treatment of one but not the other with sulfanamide antibiotics; intramuscular injection with fresh typhus; and collection of skeletons from 112 live Jewish inmates who were killed and defleshed. When you read this account, do not skip past the critically important forward by Fredrick R. Adams. It is Adams who helps put this horror into a modern and deeply disturbing context for us. Adams carefully documents how Nazi doctors shaped much of their human experimentation program after similar studies conducted earlier in the United States. He notes that “Germans lagged behind their American colleagues in implementing the eugenic endorsements of doctors.” Adams writes that as of 1995, Mississippi’s eugenic sterilization law allowing for compulsory sterilization of “the socially inadequate” was still in force. Indeed, Germany’s sterilization law, passed in 1933, came 26 years after the state of Indiana’s. What lessons have been learned from the medical experimentation horrors of the Nazis? Today, in my own field of cardiology, I am aware of clinical studies now ongoing, particularly in the areas of gene therapy and cell-based therapy, for which there are inadequately convincing animal data, yet patients are being subjected to experimentation that puts them at great risk. What chance do patients have, even the most well informed, when an arrogant and egotistically driven physician tells them that they are going to die unless they submit themselves to an unproven treatment? Are the patients told the truth — that we don’t have a lot of options, and this is an unproven therapy that will likely to do more harm than good, but we need to experiment on you? How far have we come? Can the world-wide community of physicians who did little or nothing in the 1940s afford to sit silently when modern-day leaders call for the same kind of ethnic cleansing so carefully and effectively practiced by German physicians 60 years ago? As the shocking tale concludes and becomes numbing, the reader must ask what lessons there are for us today. The health care industry, in the parlance of our times, has become a dangerous driver of the kinds of abuses that were made famous by the Nazi doctors. Too much emphasis and reward is given to those who discover new treatments for patients. Thus, the driving force for some becomes the clinical trial that leads to FDA approval of the next blockbuster drug. Have we lost sight of the moral and ethical compass that was also absent among the German doctors during World War II? Is all the excess, glory, and fortune jeopardizing the very important and necessary rights of patients to truly informed consent? We pride ourselves in having come so far and learned so much in the past 60 years about how to respect patients’ rights, but when a giant company like Merck tries to hide data about a blockbuster drug because it may be harming some patients, we must ask ourselves — how far have we come? One of the tenets of Judaism is to bear witness, not to forget, but rather to remember and learn from the past, to never let it happen again. As health care providers, we have a moral duty to first read Spitz’s alarming book and then to speak out to question and to hold our colleagues to a higher moral standard to ensure that there is no sequel to Doctors from hell.